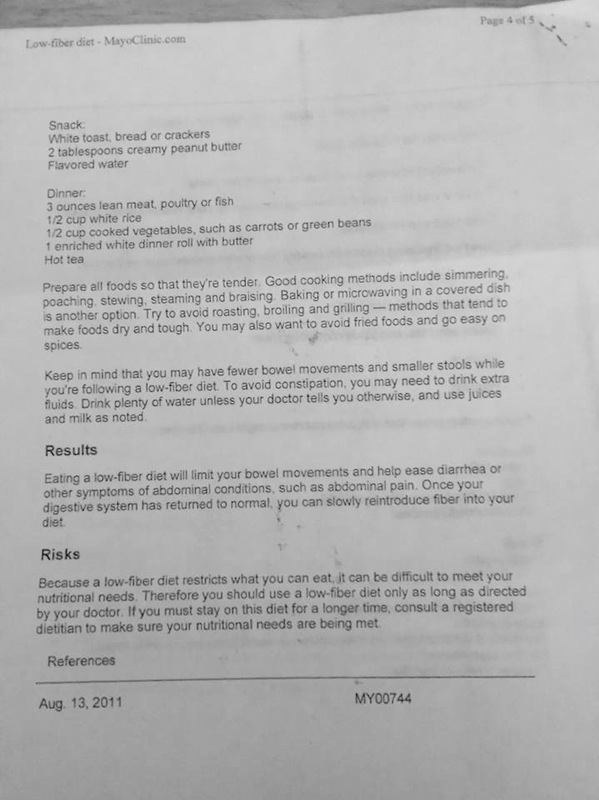 Below is a published paper by Dr. Jackson explaining the Gastroparesis diet. I know it's a *huge* change to make, especially since you could eat almost anything before GP. 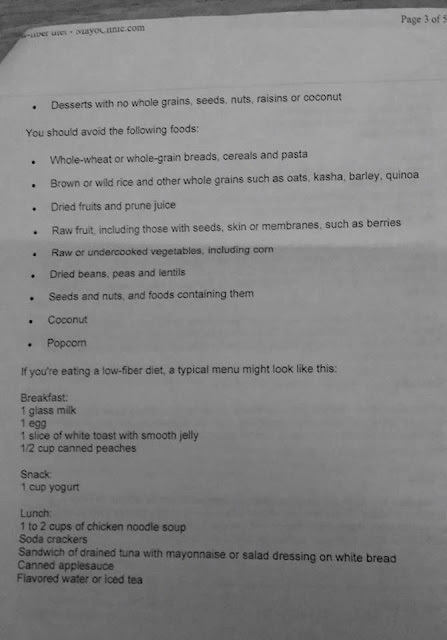 But, following the GP diet will help avoid those severe spasms and pain if you can stick to the diet. Source: This image was made by a friend for GP Awareness Month, in August. The STEP 1 Gastroparesis Diet is inadequate in all nutrients except sodium and potassium. It should not be continued for more than three days without additional nutritional support. 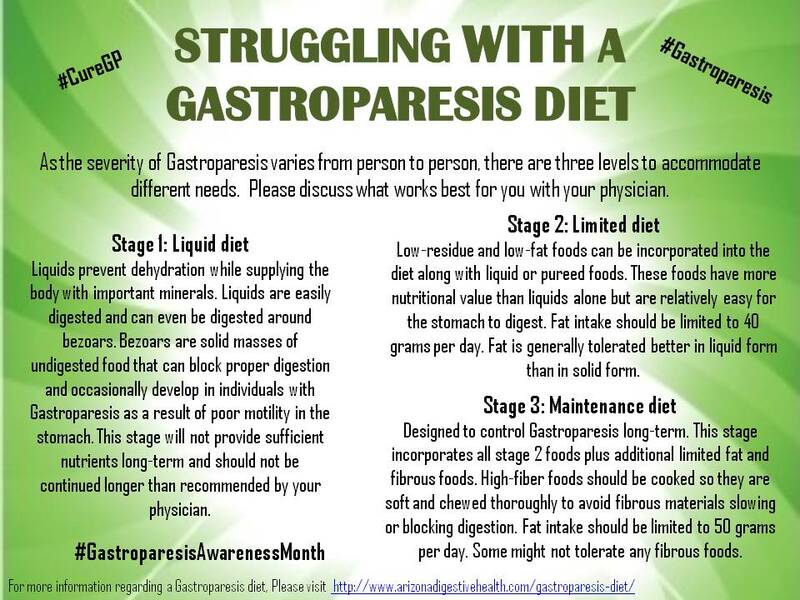 STEP 2 and STEP 3 Gastroparesis Diets may be inadequate in Vitamins A and C, and the mineral iron. A multivitamin supplement is usually prescribed. Source: This was made by a friend of mine for GP Awareness Month. 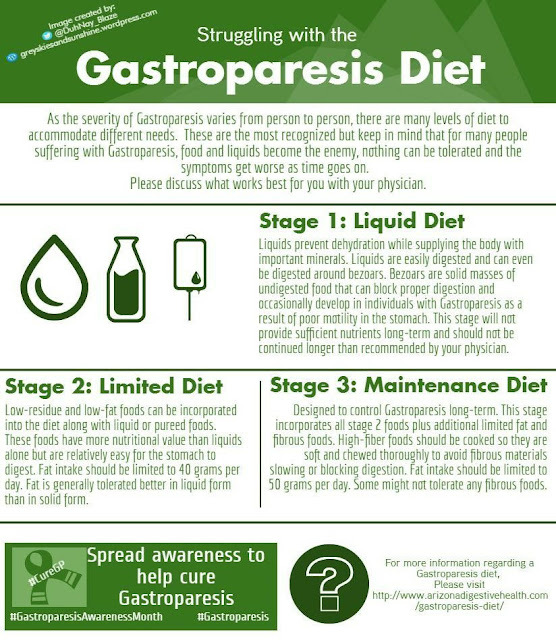 "Gastroparesis is a condition in which food is delayed in emptying from your stomach into your small intestine. 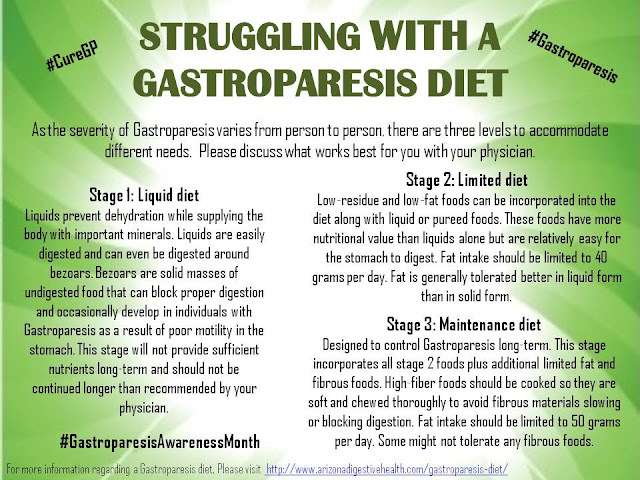 According to a 2008 article in "The Medscape Journal of Medicine," 4 percent of the United States population experiences symptoms of gastroparesis, which include nausea, vomiting, abdominal pain and bloating, weight loss, acid reflux and early satiety. Uncontrolled blood sugar with diabetes is often the cause of gastroparesis but intestinal surgery, Parkinson's disease, multiple sclerosis and other unknown causes contribute to the development of this condition. Treatment involves medication to stimulate stomach emptying and a diet that helps manage gastroparesis symptoms. With slow stomach emptying, the amount of food you eat during a meal can trigger gastroparesis symptoms if you are not careful. Eat a balanced diet, broken down into six small meals throughout the day. Sitting up at meals and walking between meals will also help with digestion and increase your appetite for the next meal. If weight loss or maintenance is a concern, be sure you are eating enough or consider adding additional small meals during the day. The amount of fat in your meals can further delay stomach emptying. Low-fat meals are recommended for better tolerance. Meat is a good source of protein, but can be high in fat. Choose lean cuts and remove any visible fat during meal preparation. Poultry, lean ground beef, fish and eggs are good diet choices. Milk, yogurt and cheese are rich in protein, calcium and vitamin D, but can also be high in fat. Pick low-fat versions for easier digestion. Added butter, margarine, sour cream, oils and salad dressings can contribute a lot of fat to your diet. Use this group sparingly and instead flavor foods with natural herbs and seasonings. While fiber is important for bowel health, a high fiber diet may exacerbate gastroparesis symptoms. 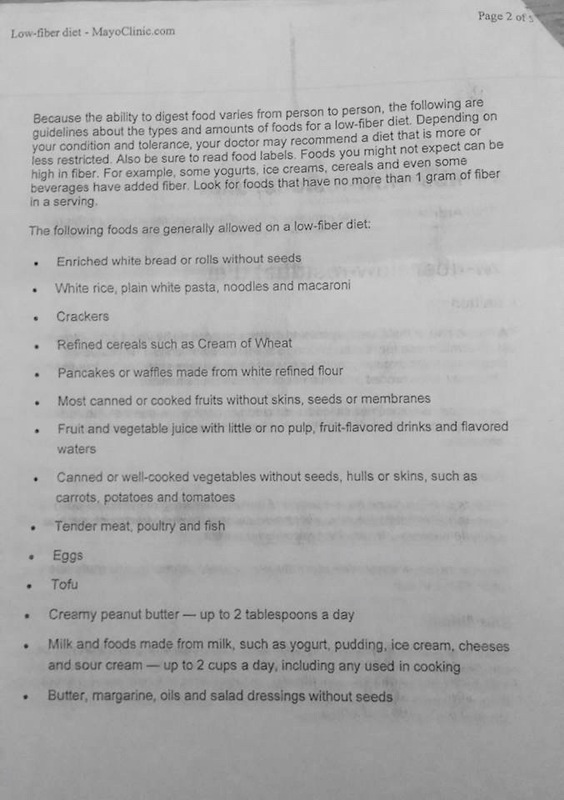 Low fiber foods are better tolerated. Stick with white bread, rice and pasta. 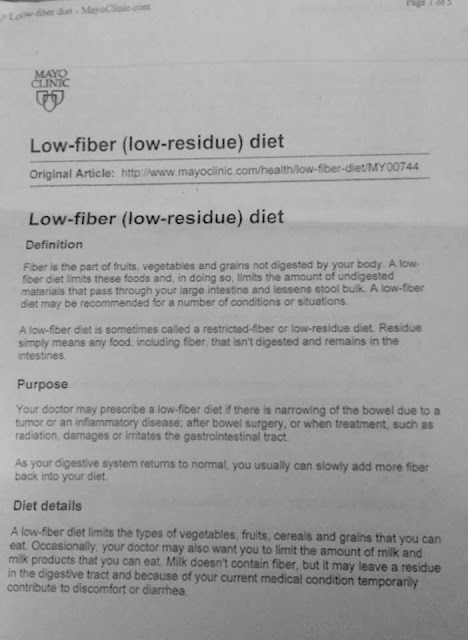 Read cereal labels and choose low fiber versions. Fruits and vegetables can be included in your diet, but stick with low fiber choices such as applesauce, canned peaches, tangerines, skinned potatoes, zucchini, lettuce and celery. Once your gastroparesis symptoms improve, you may incorporate more fiber foods in your diet with caution. 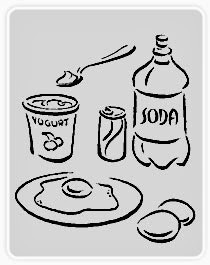 Start with very small amounts to determine if you are able to tolerate any of these foods. Managing your blood sugar level and being aware of the carbohydrates in your diet is important if diabetes is the cause of your gastroparesis. Carbohydrate sources include breads and grains, fruit and fruit juices, dairy, vegetables, sweets and desserts and some beverages. Be consistent with the amount of carbohydrates you are eating and the timing of your meals. Reading labels is helpful to identify the serving size and carbohydrate amount in your foods. Avoid a lot of sweets and desserts with added sugar and fat like cake, cookies and brownies. Instead choose low-fat cake or pudding which can help control your intake of sugar and fat." 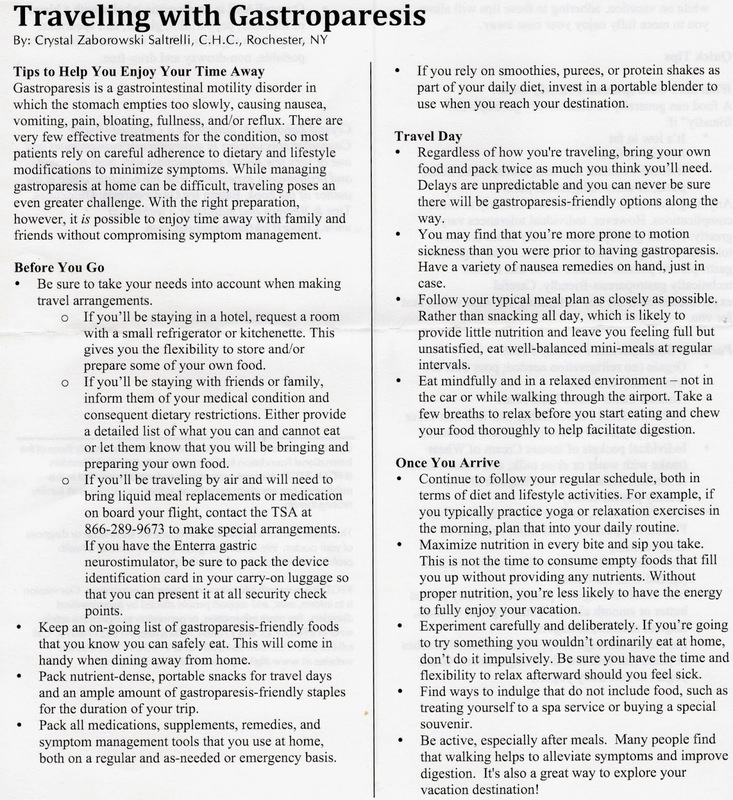 Also, please visit: INFORMATION ABOUT GASTROPARESIS AND TRAVELING WITH GP. 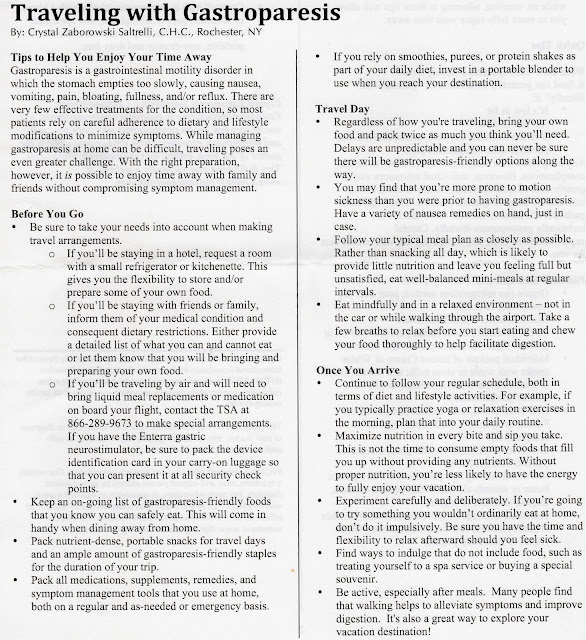 If you have a feeding tube and need to travel, please visit: TREATMENT OPTIONS FOR GASTROPARESIS & TRAVELING WITH A FEEDING TUBE. 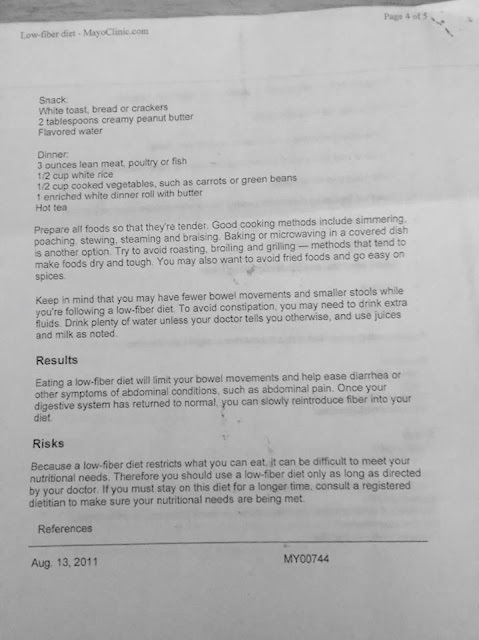 The Gastroparesis Diet from Mayo can be found here: http://www.emilysstomach.com/2013/01/gastroparesis-diet-from-mayo.html. I have a board on Pinterest that my GP friends and I post GP friendly recipes to. Please check it out. As always, be careful because some people can tolerate things better than others. You know your body better than anyone else and what you can tolerate and what you cannot. Please keep that in mind when browsing recipes. However, there are lots of "GP friendly" recipes on our board that will give you some ideas about what to make for yourself. Changing your diet can be tough, especially when most of us don't feel like eating most of the time. However, my GI recently told me to try and eat small meals as often as I can, because it gives your gut a work out, so that your gut will move things through. If you are interested in helping pin Gastroparesis Friendly Recipes to the collaborative board, leave me a comment and I'll contact you. Having help really does help me and it helps others. This is from the blog at http://blog.katescarlata.com/wp-content/uploads/2013/05/GP-FODMAPs_2013_Final.pdf, which was made by my friend, Stephanie Torres. This is the Food Map Diet I explained above laid out in a better format. 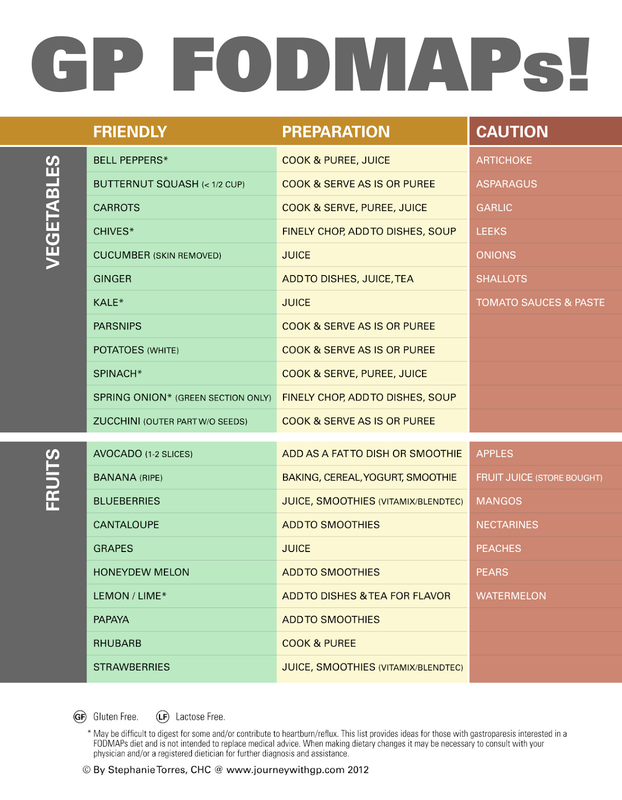 How much time is recommended to spend on each meal plan? Does it differ by individual? What is a good starting time? Several days, weeks? I'm sure your charts are great, but they are all out of focus. Is there any way I could receive a copy of this report?